Cakes of almond paste, honey and egg white dusted with powdered sugar. Their curious form serves to make them even more good. 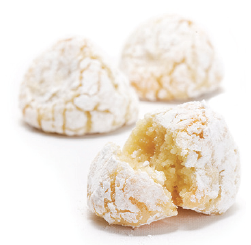 In fact, just squeezing between the fingers the balls of almond paste before baking bake knows best, and gives the misdeeds of their characteristic, delicious texture. Sweet almonds (42%), sugar, eggs, honey.